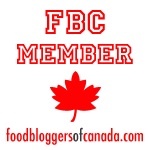 You think all I do is eat out, eh? well, it certainly seems that way these last couple of days. We had lunch, creme brulee and coffee in the Strathcona area and now we were back on The Drive for dinner. Our plan was to eat at La Mezcaleria. Our friend tried to get reservations by phone but was told parties under 6 couldn't have reservations. When we arrived at 5:25pm at the restaurant, there was no lineup but the restaurant was full with 2 tables (of 4) receiving their bills and one table readying to leave and the hostess asked us how many people there were in our party and asked if we had a reservation. Like what? how is this consistent? We are a party of 5 and you said we couldn't book a reservation on the phone and then when we arrived, you seemed to imply we could have gotten a reservation? And then told us to wait not 15-30 minutes like normal restos but 90? That is so dumb. Furthermore, she said we were 2nd on the list. By the time I asked her to cross my name off the wait list of 2, the two tables were empty and one table was about to leave. I repeated: is it still a 1 1/2 hour wait? Yes she replied without scanning the room. No smiles, no welcoming friendly attitude, not apologetic, mixed messages concerning the reservations policy and you're a HOSTESS! That was over the top. I don't care how great you're purported to be or how delicious your enticing hot stone bowls and their oozy melted Mexican cheese fondue are and how much I love your sister restaurant La Taqueria. If you're going to give me such a friggin' confusing message about taking reservations then forget it. Not coming back. Ever. My old 'hood has gone all trendy and gentrified my a$$ out of there. Such arbitrary snobbery is so short-sighted. They obviously don't need my business. Like when did this happen that we get such attitude from the service industry on the East side? I get more respect as a customer on the Westside for gawdsake. So on we walked. 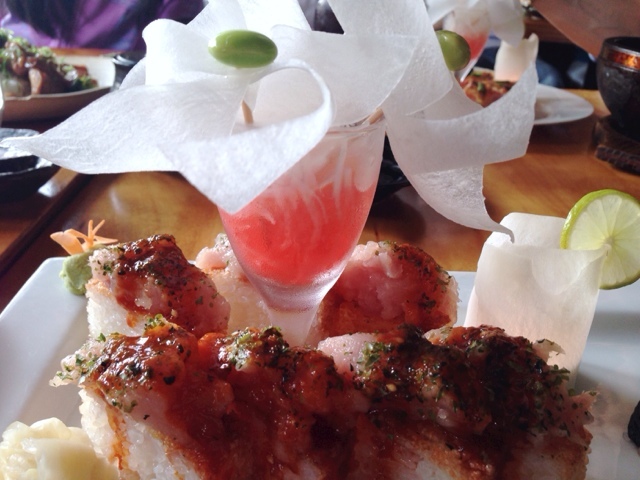 Fortunately for us, our friend recommended Kishimoto a few blocks away. It was his birthday and heck he should get whatever he wants for dinner. We got there in time and only waited a few minutes for a table and all was well. And the service here was welcoming and friendly...and the food rocked. 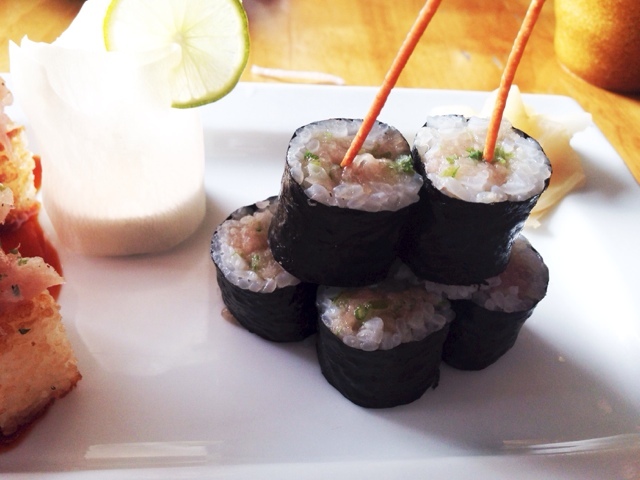 Salmon Oshisushi: a signature dish that you have to try first to gauge all other oshisushi. This was very good. We were lucky that our Japanese friend knew what to order. He recommended the Salmon Oshisushi because it was the sushi chef's take on a famous dish and his version was purported to be very good. 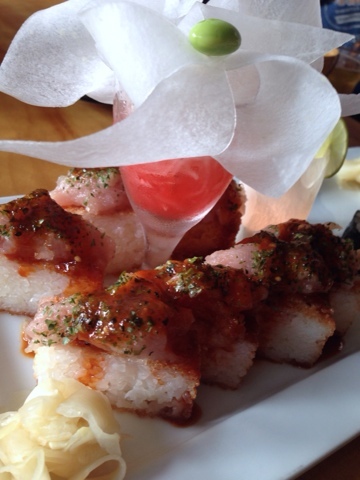 Oshisushi is pressed sushi rice topped with seared fish and toppings. The Salmon was topped with a mayonnaise based sauce and a jalapeno pepper. It was indeed very delicious. The flavours were at once smoky, creamy and spicy and the salmon rang through well. My Japanese friend told me that the chef was the same one who opened up the original Zipang on Main street but had moved on to this restaurant a while ago. I knew that he had moved but didn't realize he was at Kishimoto. 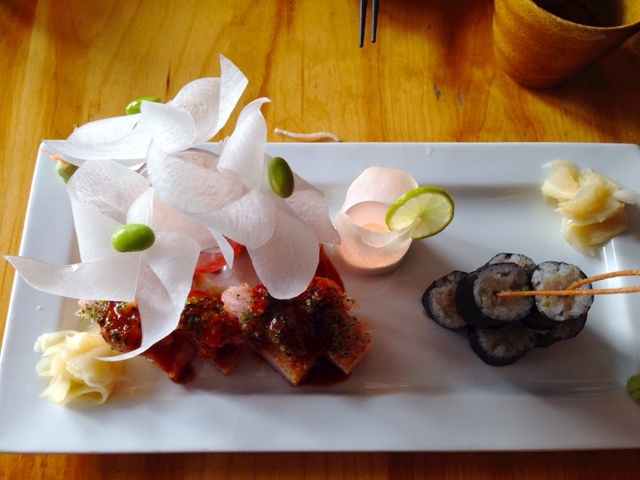 Now that I saw his signature daikon votive lanterns on his sushi platters it all made sense. 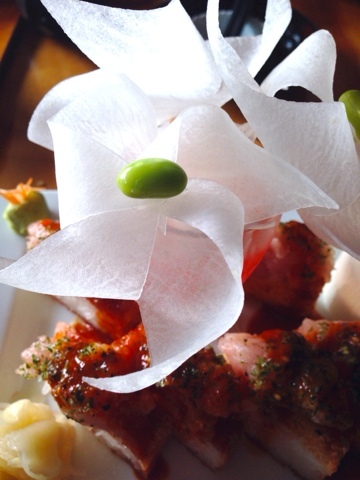 Daikon pinwheel flower decorations on my plate. Everything is edible. I decided to order a different oshisushi dish. I tried the spicy tuna. It was good; but I think the salmon was a better dish and I enjoyed it better. I am glad I sampled the salmon before I had the tuna. The pink liquid is Gatorade with shredded daikon. My Spicy tuna oshisushi was good but I don't think I'd order it again having tried the salmon one. 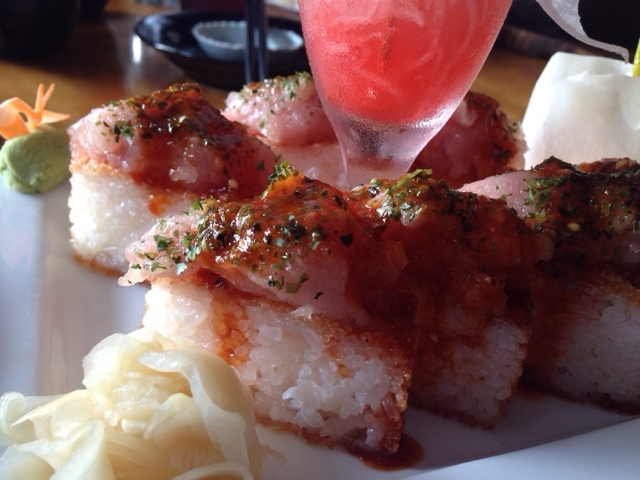 The spicy tuna was yummy and it sat atop crispy rice. 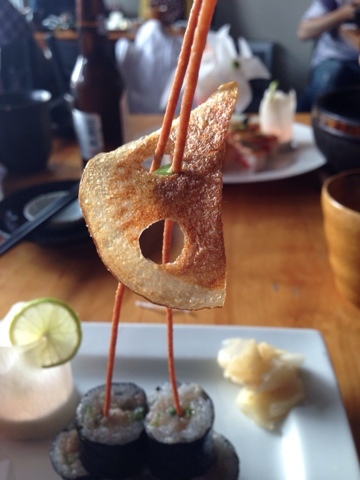 I think the pressed rice roll was deep fried for textural contrast. So it was chewy and crunchy and smoky. I didn't like the chewy element of the dish. However I know many people who love the crunchy burnt rice from stone bowls and this would be similar. The waitress was quite apologetic about the late arrival of our oshisushi orders. She came back to tell us our dishes were coming up soon. We hadn't actually asked but it was very nice to have her check up on this for us a few times. As it was it wasn't too painful a wait and when the sushi platters arrived I saw why they took more time. There was much time spent on the details of presentation. wow. I was blown away by all the stuff going on up at the top and when I started to eat after all those aerial shots (yah, I wait to eat so I can take pics for you!) I realized I had not even noticed the things going on down on the bottom. There were absolutely adorable thinly sliced carrots cut into the shape of butterflies. 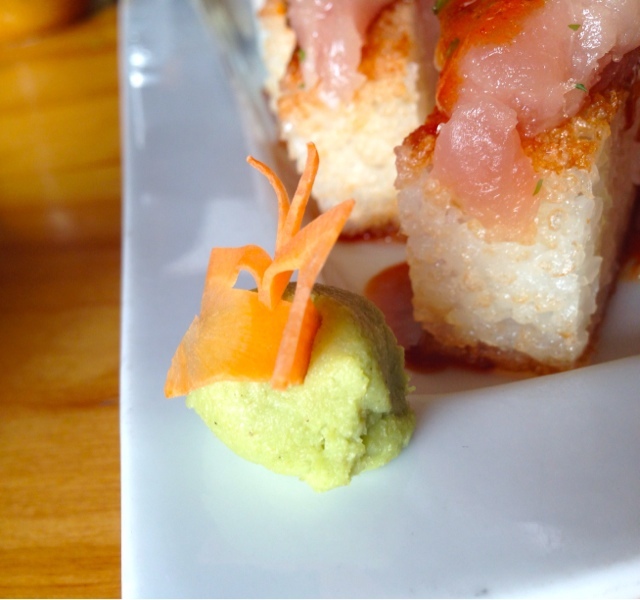 I had two little mounds of wasabi on opposite corners of my platter and each had a butterfly perched atop it. I felt so special. The kids insisted on eating all the edamame beans from the daikon flowers and they even took my lotus chip. This is what happens when you love your kids. You give them all the frilly good stuff. There are so many elements on the plate that I had to take it all in slowly. I ordered a negitoro roll too because for every new Japanese restaurant I try, I try to order a benchmark dish so I can compare/contrast quality. For me, some of those Japanese dishes might include: assorted tempura, spinach gomae, negitoro roll and a specialty roll of some sort. Stomach's benchmark staples are salmon and tuna nigiri and assorted sashimi and the kiddies order california rolls, chicken karaage and udon noodle soup. With our whole family we figure we have most bases covered. When I contemplated the negitoro maki, oshisushi and oyster motoyaki I ordered and all the other's dishes I sampled, I'd say the salmon oshisushi was a hit but probably not my spicy tuna oshisushi. I'd go for the salmon one again. And I generally don't order salmon sushi. I don't even like raw salmon. I always order tuna. Go figure. 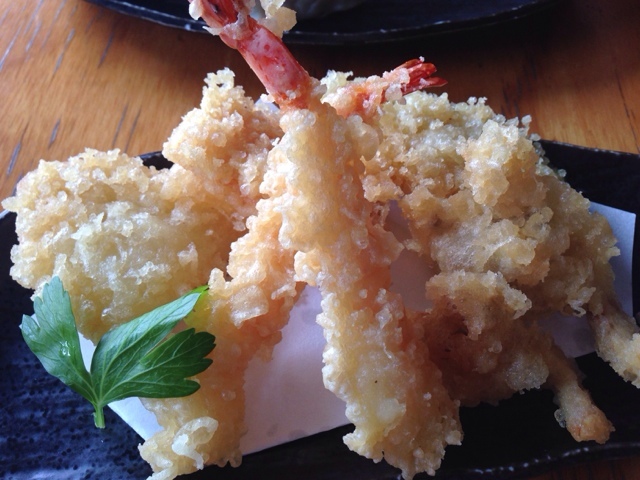 The tempura was a fave too. The batter was light and the veggies were choice: specialty mushrooms (little oyster mushrooms maybe? ), squash, prawns and yam were nicely fried, light and not greasy. I enjoyed that very much. I hate it when some restos use peppers, onion or potato in tempura and so glad Kishimoto uses unique veggies in theirs. Score. 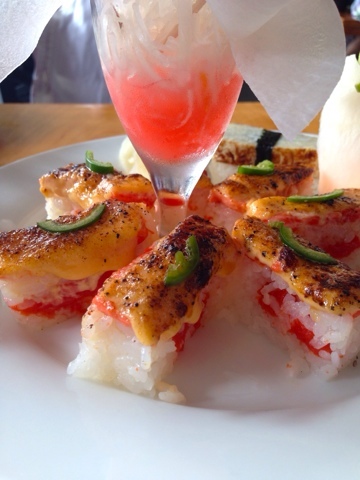 I'd order the negitoro maki again. 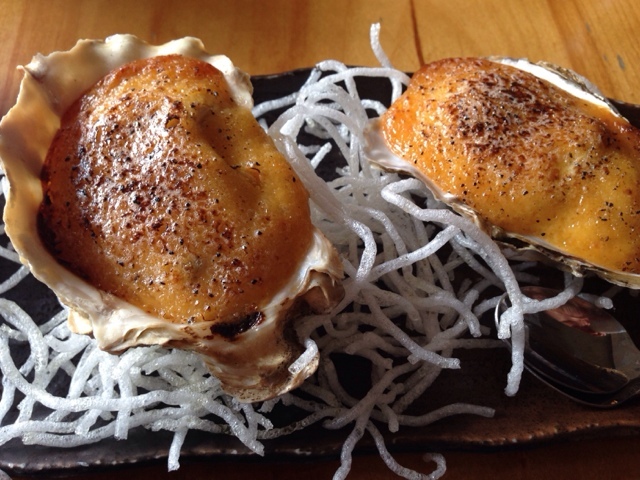 My oyster motoyaki comes with 2 oysters on the half shell for one order. When I was trying to decide what to order I asked if Stomach would have one of the oysters. In the process of dining, I forgot I had promised him one and had eaten both. oops. They were smaller oysters and quite sweet. 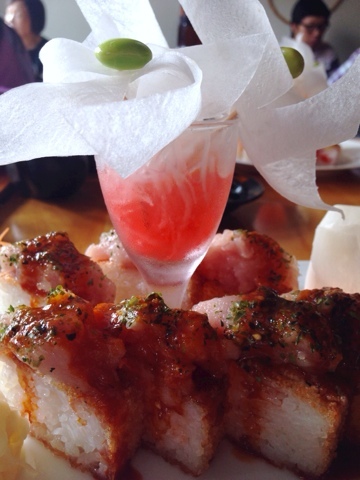 The motoyaki sauce was similar to the one atop the salmon oshisushi and was a little spicy. I really enjoyed the motoyaki obviously. Each oyster lay atop a bit of cooked spinach. 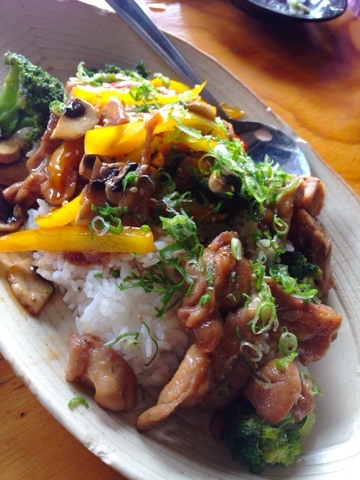 I'd order this one again. I got grief from him later on about eating his but hey, he had two Asahi beers and his big ol' plate of chicken teriyaki on rice. You snooze ya lose.